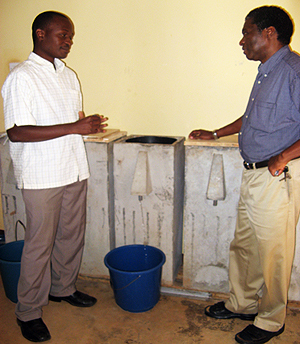 James Ntambi (right) with Paul Kimera, a civil engineer at Makerere University, who helps produce the BioSand water filters they are standing next to. Since Fall of 2002, Professor James Ntambi has led an extraordinary and invaluable program for undergraduates, taking them to Uganda to both learn about nutrition and put what they learn into practice – an experience that brings new meaning to their education. 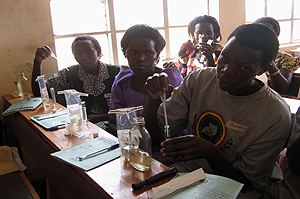 The program combines a semester course with a 3-week field experience in Uganda. During the fall course, Professor Ntambi provides students with background information on the economics and health issues particular to Uganda, so that when students arrive they have a good grasp of the realities faced by Ugandans as they make their health and nutrition decisions. Students come to realize that necessities that many of us take for granted, such as clean drinking water, food, education, and financial resources, present daily struggles for the majority of Ugandan citizens. (The photo at left shows a common water source). The success of the program is reflected in what the students do when they return. A key example is the creation of the student organization called the Village Health Project (VHP). The goals of this project are to support health and nutrition projects in developing countries and to increase awareness about international health issues on the UW-Madison campus and beyond. So far, Village Health Project has supported the building of 28 rainwater tanks in Uganda. These tanks are a simple, effective way of obtaining clean drinking water. 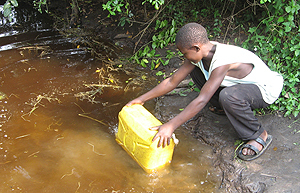 Current groups are now involved in helping to solve the water problem by building BioSand Water filters, which are cheaper than tanks and are used at the household level. Water collected from their current sources is poured through the filter and comes out pathogen-free. The students in the program do all this because they believe that in order to improve human health, good nutrition practices and clean water go hand in hand. Not surprisingly, the program has a powerful ripple effect, with valuable consequences long after the students’ Ugandan experience. For most students, the program is their first exposure to the importance of public health. Many then go on to attend elite Public Health programs across the US that include University of Michigan, Johns Hopkins, Tufts, George Washington University, the University of Minnesota and our own UW-Madison program. There are also currently 12 students in different medical schools across the US and most of the others continuing their studies in graduate programs. By exposing students to critical health issues, Professor Ntambi provides students with opportunities to learn more about themselves as future health care professionals. Please take a moment and visit the program's website: http://www.villagehealthproject.org to learn more about what Dr. Ntambi and his students are doing and have done in the past. If you would like to make a donation to this program, please send it to: Village Health Project, 239 Red Gym, 716 Langdon Street, Madison, WI 53706.